Qualcomm’s Snapdragon X24 is the first Category 20 LTE modem that can support speeds upto 2Gbps. 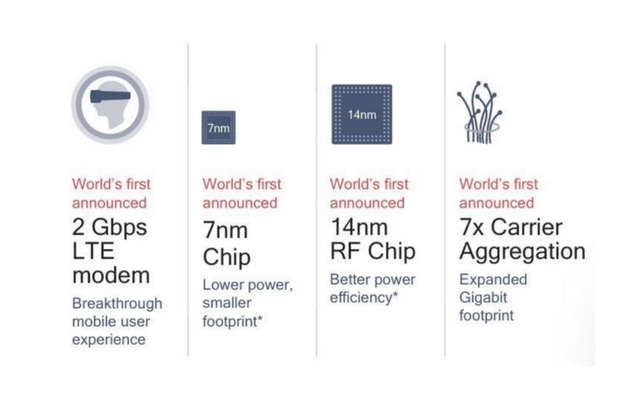 In fact, it is the first 7nm process chip on the market to deliver such high speeds. Although the final speed you see is carrier-dependent, the theoretical highs are still quite impressive to see, as 4G makes way for 5G this year. Getting into the technical details, the Snapdragon X24 supports up to seven carrier aggregation and 4×4 MIMO antenna arrays on up to five aggregated LTE carriers. Qualcomm claims that the X24 equipped devices can connect to the entire range of spectrum bands available to carriers. Are you wondering why Qualcomm is still putting in so much efforts to improve LTE chips? As it turns out, upgrading LTE is an important part of our 5G future and it’s intended to make the transition to 5G less painful for users of current 3G or 4G phones. Thanks to its partnership with phone makers like HTC, LG, etc. Qualcomm is on schedule to bring the first 5G phones to market in 2019. However, it is expected that it will take much longer before 5G is widely available and supported. As of now, Qualcomm is focusing to bring Snapdragon X24 equipped devices to the market by the end of 2018.